Our daughter is a want-to-be artist. Actually, she has one art gallery showing under her belt (a youth art show in which at 5 years old, she sold all of her pieces). We have tried to spawn an appreciation for the arts in our children by visiting art galleries and museums and buying fine art for our home. During our past cruises, we have purchased art through Park West Gallery, which houses art galleries and auctions on board many cruise lines. As a result, we have been invited to VIP auctions stateside, where we get to meet the artists and have an opportunity to acquire their works. Yes, we have spent way to much on artwork over the past few years, but the pieces adorning the walls of our home are worth so much more to us because of their sentimental value. Each piece has a story and a memory that is cherished by our family. Our favorite thing about these events is that you get the opportunity to meet the artists and speak with them about their artwork. Last year, we got to meet the artist Simon Bull, who, while sharing his inspiration for his work, spoke to our hearts in an unbelievable way. Yes, we are now the proud owners of a Bull original that hangs prominently in our home. We also enjoyed seeing masterpieces by artists like Duhrer, Rembrandt, Chagall, Miro, and Picasso. 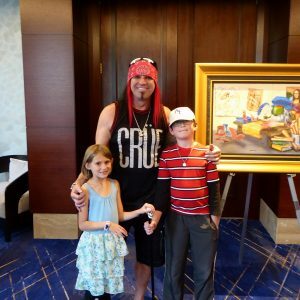 At this year’s event, our family met three artists: Alexandre Renoir (the great-grandson of French Impressionist Pierre-Auguste Renoir), Kalinka (the daughter of artist Duaiv), and Michael Godard (artist friend of Ozzy, Carrot Top and many other celebrities). Each night, we got to hear one of the artist speak about their life story before their newest original art was revealed. The next day, before their pieces were auctioned off, they would speak in depth about specific works, what inspired them and what each one meant to them. The kids and one of Godard’s newest works. 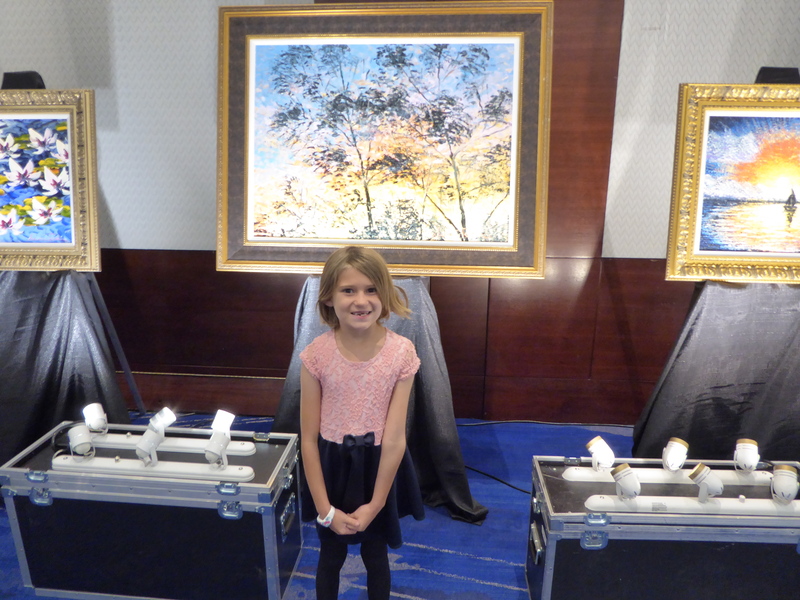 Our daughter obviously has been interested in the art world for some time and loved every second of the event. We were worried, however, that our son would not be interested. He surprised us and actually enjoyed meeting the artists and learning their stories. He wanted to meet with them, get pictures taken with them, and create his own artwork to give to them. 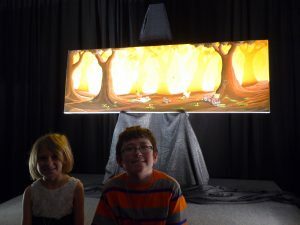 The artists were very warm and encouraging to our kids. Our son sketched an alien on a piece of Ritz Carlton stationery to give Alexandre Renoir. Renoir was gracious in accepting the sketch and told our son that no one ever gives him a copy of their art. Later in the day, we ran into Renoir outside the hotel. 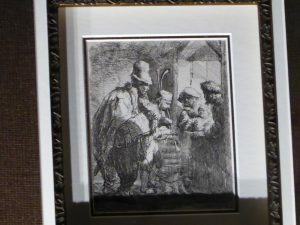 When he saw us, he waved us over, reached into his breast pocket, took out our son’s sketch, and told us that he was going to hang the sketch in his studio. Our son was overjoyed and returned to school telling everyone his artwork was in an artist’s studio. Michael Godard is a force of nature. 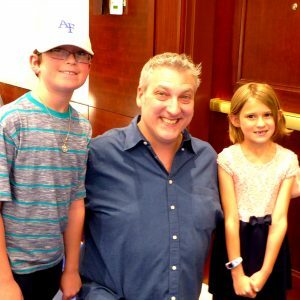 He had us laughing in stitches as he told some life stories and also touched our hearts as he spoke of his work with St. Jude’s Children’s Hospital and other charities. He, too, was so generous with our children. He asked about their artwork and encouraged them to draw an olive (Godard’s cheeky artwork tells bizarre stories about martinis, olives, strawberries and grapes) to give to him the next time they meet. Will we ever meet Godard again? Who knows, but our kids are working on their olives in preparation for just that. Since our VIP weekend, our kids have been diligently creating masterpieces. Both have started using palette knives since they have learned that Renoir uses them. They have drawn inspiration from the images of Kalinka. They have downloaded screensavers of Godard art and our son has even changed his profile picture to an image of Godard. He wears the dog tag pendant that Godard gifted him (and all other attendees) nearly every day. We all created new memories that we’ll carry through the rest of our lives. We all have a greater appreciation of the art world and a new-found respect for artists. That’s a great thing. If you get an opportunity to go to a Park West auction while cruising, we would highly recommend it. Who knows, you may discover a nascent artistic ability in your child. Have you been to an auction? What were your impressions? Are you an art collector? Whom do you collect? Tell us in the comments. We’d love to hear from you. What a wonderful experience for everyone! Even better that it turned out the way it did because you were not necessarily expecting it, especially with your son. I think perhaps your children were just as much as a “novelty” for the artists in attendance at this event as they were to your kids. Upon first seeing your photo of your daughter on your Pin, I thought gee I hope she isn’t being auctioned off! But with a grin I knew that would not be the case. Hearing different artists speak about their famous relatives and then about their own lives and journeys must have been great. Enjoyed this post and the photos. 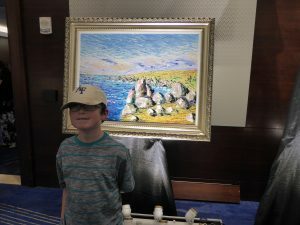 I took my son to an art auction recently, it was a fundraiser. Nothing was hugely expensive. He loved it though. He was given a budget and he managed to get two paintings he liked 🙂 He loves to draw so it was a great experience for him. I’m sure it is an experience he will treasure forever. 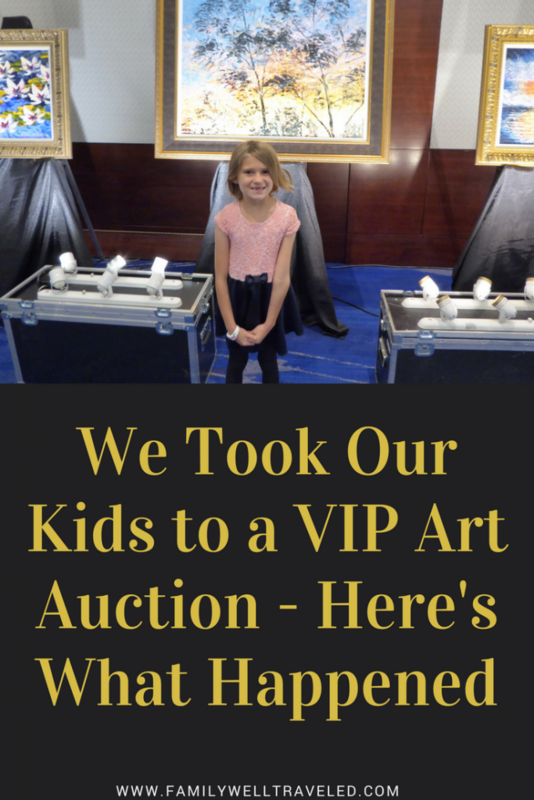 I have never been to an auction, but would love to go! These masterpieces are amazing. I like the idea of exposing kids to art at an early age. This is great! Nice. I wish I got interested in art when I was a kid. I started photographing just few years ago, and when I started taking it seriously, I have realized I need to understand paintings better. It’s never too late to start learning. It is awesome that you support your daughter’s love of art the way you do. And great that your son had a good time as well! What a cool experience! This is a great thing to show kids so they start appreciating art at an early age! Wow, its great to hear that your kids loved the art show so much. Such a great experience to immerse them in, thanks for sharing. This is actually a really interesting post – I love the way your son was onboard with it all and enjoyed it. I would love to have met the artists there. My first auction was tiny and I begged my grandma to buy my a £1 sheep painting which still have.